SIP is a globally standardized hands-on venture capital, which offers risk investment, incubation and support to venture companies.? We believe that an innovation system by entrepreneurs is a driver in capitalism. Venture companies are the main players in an innovation system, which would drive capitalism. Innovation systems such as cars, electronics, and internet have been the main businesses of the era.? In SIP with the belief that “companies or business people with innovation will contribute to the society most and yield development,” we discover, support, and invest in entrepreneurs, who will make innovation happen. 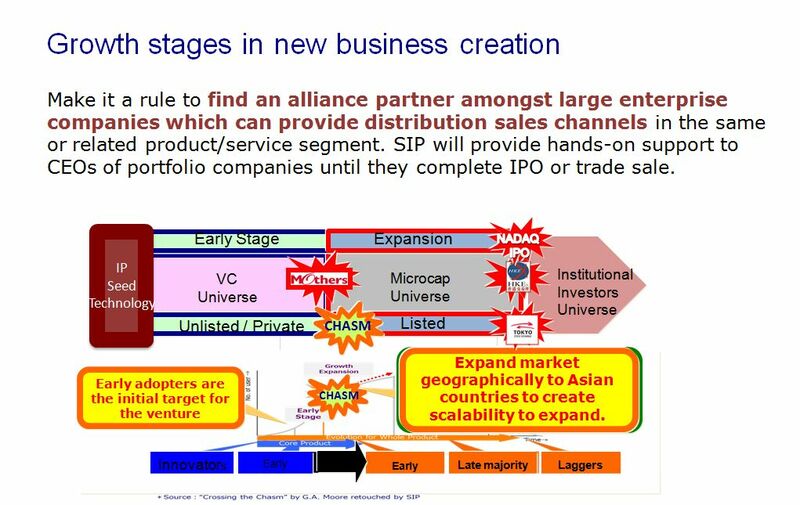 SIP believes that “money-loss companies in the early stage, which have developed excellent products but its evaluation in the market has not yet reached to a certain critical mass in sales volume, and seed venture companies, which are currently in the process of developing products, should be innovation leaders.? In addition, it would be the foundation of existence to invest in venture companies in the early stage in order for venture capitals to establish a status in the business community.”? The investment in venture companies in the early stage requires not only simply discerning portfolio investment, but also hands-on capability in order to support to establish business partnership/capital affiliation, which is to develop a potential product of venture company, using major marketing channels.